At the foot of Wellington Street in London, where the busy cycle route from Waterloo Bridge heads into Covent Garden, there was, for a while when I lived there, a notice. The police had received numerous complaints, it said, from “the community” about standards of cyclist behaviour in Covent Garden. It suggested, essentially, that cyclists should smarten up their act or face unspecified consequences. The notice irritated me on several levels – but the most profound was the notion that “the community” were the real people and the cyclists some alien, invasive species. The irritation was all the greater because as an area Covent Garden seldom showed much respect for cyclists’ rights. I have a vivid memory of cycling across the pavement (sidewalk, American readers) at the foot of Wellington Street with a drunk tourist yelling at me that I wasn’t allowed to ride there. He was standing directly on top of a bike symbol, on the clearly marked cycle lane. Questions about traffic and its relationship with communities have been occurring to me again over the last month as I’ve pondered a series of appalling tragedies on the streets of New York City, where I live now. The highest profile – the killing in a car crash in the early hours of March 3 of two expectant parents, Nachman and Raizel Glauber, and their baby son, delivered prematurely after the crash – raised the issue most clearly because of their own community’s very obvious reaction. The couple, only 21, belonged to prominent Hasidic Jewish families. Their deaths – a speeding, possibly drunk driver smashed into the livery cab they were using - were marked by a funeral that brought 1,000 men in dark coats and wide-brimmed hats onto the streets of Williamsburg, one of Hasidism’s Brooklyn strongholds. But nearly any traffic tragedy – and there have been many in New York this past month besides the widely-noticed ones - raises at least some questions about how different communities relate to and use the street involved. I’ve been thinking particularly deeply about the link each morning recently as I’ve cycled past the junction of Clinton Street and Atlantic Avenue in Brooklyn Heights on my way to work. 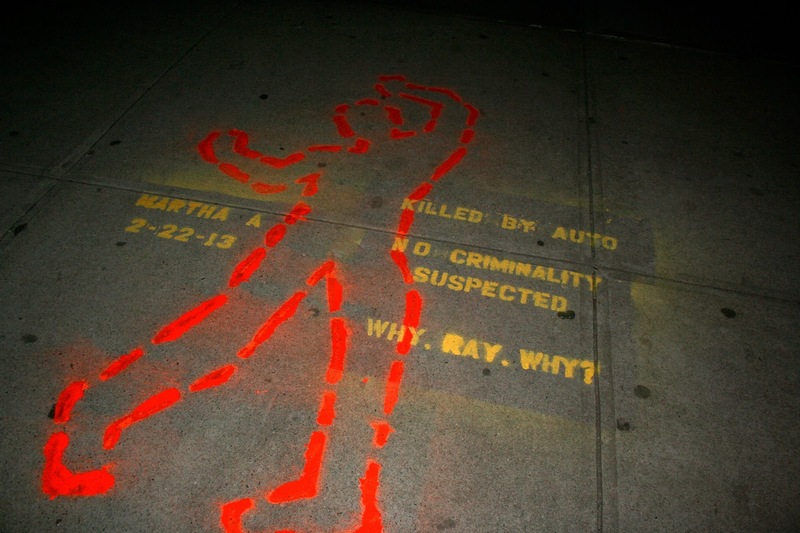 A line of potted plants by a shop window and a stencilled outline on the sidewalk mark where, on the evening of February 22, a driver mounted the sidewalk in his speeding, out of control SUV. Martha Atwater, a 48-year-old writer and mother of two children, was emerging from a bagel shop and died on the sidewalk shortly after the vehicle hit her. The regular arrival of fresh floral tributes testifies to what I read in the days after Ms Atwater’s death – that she was a well-known, well-liked participant in many local activities. She was the embodiment of the strong sense of mutual responsibility and joint action that makes the best New York neighbourhoods such desirable places to live. But I saw little reflection amid the tragedy of Ms Atwater’s death on New York’s wider traffic culture, which claimed another high-profile victim less than six days later. On the morning of February 28, Amar Diarrassouba, 6, was crossing E117th street in East Harlem on his way to school when a huge truck drove through the crosswalk, killing him instantly as his 9-year-old brother, who was accompanying him, looked on. The grief in Amar’s case focused not on the miserable, pointless loss of a bright young boy or the driver’s culpability but on Amar’s school crossing guard. The woman, who on a previous occasion reportedly snatched a child out of the path of an oncoming car, should have been present at the crossing when the collision occurred but wasn’t. Astonishingly, the police investigation of the truck driver appears to have concluded with his receiving traffic tickets for failure to yield and failure to execute due care – minor violations that nevertheless suggest he was entirely responsible for Amar’s death. The investigation into the crossing guard – someone who, whatever her shortcomings, did not negligently drive a huge truck over a blameless six-year-old – continues. The attention on the crossing guard was typical of the focus after each of the tragedies on the crash’s individual circumstances and what made it exceptional. There has been very little reflection on how general traffic conditions in the areas concerned contributed to the deaths. The intersection the driver that killed Martha Atwater crossed. That omission struck me particularly in Martha Atwater’s case because of an online argument I entered a few months ago with a resident of Cobble Hill, just across Atlantic from the crash scene, about traffic calming. He was angrily complaining about how unsightly a projected traffic-calming scheme for the area would be and what congestion it would cause. But it seems fair to suspect that such traffic-calming would have made it much less likely a speeding SUV would shoot across Atlantic Avenue and kill someone. The most shocking effort to shift blame came in Amar Diarrassouba’s case. The community board for the area where Amar died – the local body that has the final say on many local planning issues in New York – in late 2011 withdrew previous approval for a protected bike lane along First Avenue in the area. Most studies suggest such lanes, as well as benefitting cyclists, make crashes like the one that killed Amar less likely. Yet when Steve Vaccaro, a cycling lawyer and activist, pointed out the community board’s role on Twitter to Erik Mayor, a local restaurateur and community board member, Mayor preferred to put the blame on the least blameworthy actor in the entire episode. “The child was being walked by his nine-year-old brother, who did not pay attention,” Mayor wrote. which some Hasidim might prefer weren't there. The truth is that road deaths all over the world nearly always result at least in part from failures of road governance. Those often result from local communities’ tendency to assume the main priority for roads is to meet the needs of the people that they regard as their “community” – people who have similar needs and habits to them. That is particularly revealingly the case where the Glaubers’ community is concerned. Few Hasidic Jews cycle and some Williamsburg Hasidim successfully campaigned for removal of a cycle lane along Bedford Avenue through the heart of their community. One community spokesman said that, although the ostensible reason for the campaign was their disapproval of women cyclists’ “immodest” dress, it was also the case that “everyone” knew a bike lane was a “nuisance”. There have also been attempts to discourage cyclists from using bike lanes along Kent Avenue, the street where the Glaubers were killed, apparently because Hasidim wanted back the parking spaces that the bike lane took. Erik Mayor’s reaction shows a similar myopia. He couched his original opposition to the first avenue bike lane in terms of the likely effect on local children. He claimed – improbably – that a bike lane would increase asthma among children because it would increase congestion and hence emissions from idling cars. But when the lane’s absence contributed to the crushing to death of a boy from the area’s distinctive west African community, his sympathy seems to have evaporated. A strong theme running through many “community” expressions of concern about their local roads is that they focus on the problems that cause the most vocal complaints locally – the struggle to find parking places or local shopkeepers’ grumbles about business – rather than local roads’ role as thoroughfares. Yet roads are inevitably the vehicle for the habits of one community, no matter how distinctive it might be in many things, to run – sometimes literally – into another’s. The wide, unobstructed local road might seem vital to you because it offers plenty of parking spaces. If it looks to people from neighbouring communities like an invitation to drive at twice the speed limit, your community is likely to pay a heavy price. It’s for that reason that it makes little sense to hand governance over important issues of roads policy to bodies as locally focused as New York City’s community boards. The New York City cycling map testifies to their influence, with cycle lanes along long avenues changing in nature or disappearing altogether according to their whims. It’s an area where London, for all its drawbacks, seems largely to be doing better than New York. The boroughs of Wandsworth, Westminster and Barnet – all controlled by the Conservative Party – are undoubtedly less bike-friendly than Camden or Tower Hamlets, controlled by the Labour Party. But the overall strategy seems less likely than New York’s to be derailed in places because of loud, locally-focused complaints. More generally, meanwhile, it’s always worth thinking when anyone talks about “the community” about whom their definition excludes. While “community” as a term comes wrapped in warm pictures of neighbours chatting and people banding together to do good, it often says as much – as in that Covent Garden notice – about who’s on the outside. The Covent Garden community clearly excluded people who rode bikes. The community board for East Harlem seems to have seen itself as more answerable to car-users than cyclists or people who might benefit from safer streets. didn't feel like part of his community. The police think we're all part of the same problem. My own tendency to think sloppily on this topic came home to me on Thursday evening when I encountered the aftermath of a collision on my way home. An ambulance was taking away a cyclist whose mangled bike lay by the roadside. A quick scan of the machine – a nasty aluminium full-suspension mountain bike – led me to a quick conclusion. This was the machine of either a food-delivery cyclist or one of the youths from the local public housing. He wasn’t part of my cycling community. That made little difference to one of the policemen at the scene, however. Having already apparently decided the cyclist’s failure to stop appropriately had caused the crash, he was keen to share the news with anyone else rash enough to ride a bicycle – even one dutifully stopped at the traffic lights. Looking towards me as he walked back towards his patrol car, he addressed me with a sneer in his voice. “I guess he just had to stop,” he said, shaking his head. The "elephant" in your post is the notion that 4000 lb vehicles should be allowed to shoot around any but a small minority of streets and that it is OK for us to let people to operate such dangerous contraptions with little oversight. There's a whole herd of elephants in the room in this post. But, at the risk of straining the metaphor, I didn't want to expand the room far enough to accommodate all of them. A blogpost of more than 1,500 words is already at risk of overstaying its welcome. You are nevertheless entirely correct that it's astonishing when one thinks about it how much latitude drivers in charge of such deadly machines are given. I criticised the eye-poppingly lax enforcement of traffic laws in New York in a previous post: http://invisiblevisibleman.blogspot.com/2012/10/do-as-you-like-motorists-and-dont-blame.html There was some comment after Amar's death on whether the truck involved - which must have weighed far more than 4,000lb - was in fact allowed to use the street involved. It might well not have been (albeit the NYPD don't seem to have thought that aspect of the story terribly worthy of investigation). I am sure that one day people will look back on the current model of road use and think it crazy that life was wasted on such a scale and so avoidably - just as we now look back on, say, the murder rate of the 1970s or industrial accident rates of the 1950s and wonder what mad world stood by and let them happen. You are very kind, ohthatbritishbloke. Not quite sure I'm understanding your point about localism: is it that the focus of a community board covers too small an area, but a London borough covers enough to be able to make a difference on a strategic level? As you point out there are still issues with a lack of coherence across London as a whole. There are other issues surrounding localism not acting locally enough. Cambridge, for instance, has the highest rates of cycling in the UK. However control of transport is not held by the LD/Labour city council, but rather by the Tory controlled county council. The residents of the city, although hardly of one voice on the issue, are generally more in favour of decent cycle infrastructure, but the county covers villages and towns of the people commuting into Cambridge by car. Locals want to be able to walk and cycle free of the noise and pollution of motor transport: those outside the city want to be able to reach their destination within the city by car. Of course many of these villages are actually within reasonable cycling distance but the mindset is one of car dependence. It is not so much that the county won't spend money on cycling, but are very reluctant to take take measures which affect car use. So there is some good infrastructure away from the roads on routes that never had car access: purpose-built cycle bridges and tracks besides fields and railways and busways. However the main roads are as bad as anywhere else, and that covers a lot of the journeys people need to make. But I see the same extreme localism you mention too. In my city ward there is currently an issue over a shared pedestrian/cycle bridge which 'local residents' are concerned is dangerous and shouldn't allow cycling. It seems to escape some people that there are people such as me who are both local residents and cyclists and would quite like to be able to travel away from our homes by bike. In fact given the general levels of cycling in Cambridge, it is reasonable to assume that far from being an out-group, this is a large proportion of the population, but not one that is necessarily consolidated into a single pressure group. I guess my objection to how Community Boards operate in New York City would be this. They're given responsibility for a large number of planning decisions in their area and there's no obligation whatever for them to fit in with city-wide strategy. So, for example, they can hold up a bike lane on First Avenue over purely local objections while other Community Boards further down First Avenue move ahead with building one. It seems to me there needs to be a better mechanism for taking some of these decisions that clearly reach beyond the area out of the Community Boards' hands. I can understand, however, that local Community Boards should continue to have a say over things like bike parking (even though they often seem to get ridiculously worked up about clearing such projects for installation). I wrote a bit about Cambridge when I was the Financial Times' transport correspondent and I know commuting there is an issue. I guess my overall point is that decisions about each form of transport are best made at the level that affects it most. Cambridge's policy on cycling would be best handled at the city level. It's clear that questions of how one handles car commuting need to be made at a wider level. There somehow has to be effective co-ordination between the two. That's a hard thing to do and I don't know quite how to achieve it. But then I'm a writer, rather than a policy-maker, so at this point I get to shrug my shoulders and hand the problem over to someone cleverer than I who'll come up with a solution in less pretty words. I hope that works out. I really enjoy your posts a lot, and I think you're particularly perceptive when it comes to understanding how structural road relationships dictate system outcomes. For instance, in this post, you're able to see how widespread focus on the automobile for city road networks results in harmful accidents, at the particular expense of non-auto road users. But I would say one place that we depart is I would argue you sometimes interpret the car-centric opinions of many individuals as an individual shortcoming, rather than a product of existing social structure. This is, of course, a minor departure. But in many ways the point of view of the shop owner, the police officer, and whoever put that "community sign" is sort of the natural and default response to a systematic advantage that is afforded to automobiles. It is pervasive throughout society, and it gets inside us. It's hard to blame individuals for responding to it in what appear to be unsavory or unsympathetic ways. Not everyone has the luxury of getting to consider so many nuances of these issues. Luckily, you and I, as cyclists, DO get to see the road network for its proverbial trees. But it's hard to blame to many people for not being able to see what's beneath. I should reiterate, this isn't really a criticism, since I really love your incisive analysis, and certainly couldn't do better myself. I agree that much of people's thinking about this is unreflective and that the person at the police station who typed out the "community" notice on Wellington Street probably hadn't thought through its implications. There aren't enough transport nerds to go round to put up all the notices people want to put up and think through all their implications. But in central London - particularly somewhere like Covent Garden - the number of members of the public who actually try to drive anywhere is absolutely minimal. In that bit of central London, private cyclists going about their daily business would have to outnumber private motorists. I would argue that any police commander in charge of putting those notices up in that place should have had the intelligence either to think through the notice's implications - or to face down the irate local people at whatever meeting they held where someone demanded it be put up. I accept that the default option in British society, American society and every other major rich world economy worldwide is that people travel by car. It's the option into which vast numbers of people fall. But we're both proof that those choices are not inevitable. Western, rich societies are more or less by definition ones where one has a choice. Just because nearly everyone makes a poor choice doesn't mean one is doomed to do so oneself. Nevertheless, there are issues that we decide as societies at the level of cities or countries that have a huge effect on how people choose to travel. I've argued strongly here that those choices should reflect more accurately the costs to society of the pollution, greenhouse gas emissions and crashes that result from the current order. That would make it easier to cycle. But I believe there should always be an element of choice in these things - and we should admire the minority who currently make good choices, just as we may tut-tut in future over the few who make poor ones. I think that the reason behind the increasing number of the road side tragedies and accidents is the racers and other people who drive their car with a rashly manner.